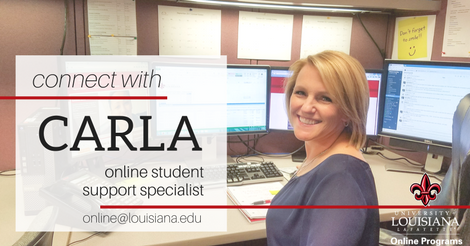 When it comes to having a lifeline—a person who understands and is always ready to help—anyone interested in online courses and degrees has a special connection at the University of Louisiana at Lafayette. That connection is Carla Fontenot, online student support specialist. • A 41-year-old oilfield worker who was working out of the country, but he wanted to take his first college course. With Fontenot’s encouragement, he took the leap online. • A 23-year-old student had changed her major several times; she had lots of credits but no degree. Fontenot pointed her toward UL Lafayette’s online Bachelor of General Studies program. By taking 15 hours of credits online, the student can graduate in one semester. Fontenot knows the challenges these students face, because she’s been in their shoes. Her studies were interrupted for years until she used online classes to complete her bachelor’s degree from UL Lafayette in 2011. No matter what students need, Fontenot is there to assist and stays connected with them through the process. Anyone interested in more information on the online Bachelor of General Studies program or other UL Lafayette online degrees can get started by filling out this form. If students are ready to apply for admission, Fontenot instructs them on how to proceed. If they need financial aid, she guides them in filling out the form that gets them started. If they will be paying for their education out of pocket, she discusses the University’s payment plan. Often, students stay in touch with her during the semester. Being able to earn a Bachelor of General Studies degree online is a huge boost for some students, Fontenot said. In just its first full semester this fall, a group of students will be graduating in December. And for Fontenot, that’s really satisfying.